Betty MIRZA-MIOT mainly focuses her practice on cross-border transactions especially on corporate matters, including mergers & acquisitions, financings, real estate cases and commercial agreements involving private and institutional companies in a wide range of industries. With a strong knowledge and experience in Middle East and foreign investments Betty also has a particular expertise in assisting, namely foreign clients, during negotiation sessions, as well as handling complex corporate structuring. 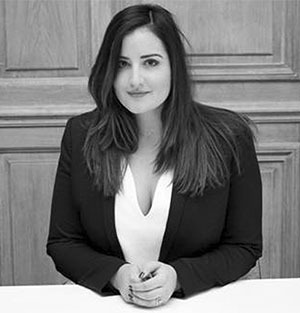 Admitted to the Paris Bar in 2015, Betty graduated from University of Paris II (Assas) with a Masterés degree in International Law and holds an LL.M. of Business Law of the Arab countries. Pro bono activities: Non-profit organizations.